GOSH!ABOUT: B’nai B’rith Event “Trends And Developments In Foreign Investment In NY Real Estate” – GOSH!About: Fashion. Art. Music. Events. TV. Non Profits 'N' Lifestyle > Subscribe now! On Tuesday, June 5th, 2018 at the Cornell Club in New York City, the B’nai B’rith held a valuable and resourceful event called Trends and Developments in Foreign Investment in New York Real Estate, attended mostly by real estate agents, investors, brokers. We enjoyed the fine buffet. The salmon with pasta in a cream sauce was very different and tasty along with the kale salad and chicken. 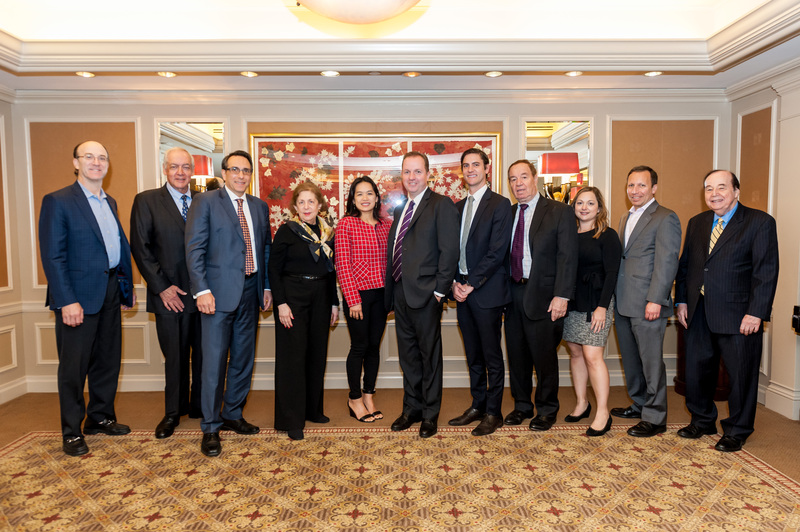 Michael J. Romer, managing partner of Romer Debbas, moderated a speaking panel featuring Dylan Pichulik, CEO, XL Real Property Management, Julie Pham, Associate Broker, Corcoran, and Michael Zukerman, Of Counsel, Warshaw Burstein and Managing Director, Whitestone Realty Capital. They discussed the current and future trends of foreign investment in NYC. While NYC gets lots of money from foreign investment like London, along with more stability, low cap rates, and liquidity compared to other areas, the panel felt there were concerns about the over pricing. They felt there has been some slow down in foreign investment from certain countries such as China and Russia due to tightening of outflows. However, they see more foreign investment from countries like Brazil and Mexico, yet see less cashflow as before with some debt. If you don’t know who Michael J. Romer is, he is the managing partner and founding member of Romer Debbas LLP, a 20+ attorney law firm based in Midtown Manhattan. He helps foreign investors in purchasing, selling, leasing and financing. Michael was selected to the Super Lawyers List for 2018 and selected to the Rising Stars List from 2013 – 2015. To even participate in Ask Super Lawyers, an attorney has to be selected to a Super Lawyers List and has undergone their patented multi-phase selection process. Across the United States, only the top 5% of each state’s attorneys are selected. Impressive! Dylan Pichulik, manages foreign-owned apartments in hundreds of residential units. Julie Pham, is a nationally ranked broker that is consistently ranked as a Top 250 Agent nationwide in the Wall Street Journal. Julie graduated with an MFA from Columbia University as a Ford Fellow. Also, she studied literature at Oxford University and The University of Texas at Austin graduating Phi Beta Kappa. One would not think she has directed and produced several award winning short films and documentaries. Prior to her career in real estate, Julie worked at Ruder Finn, a global public relations firm; And she is also a classically-trained pianist. Michael Zukerman, an EB-5 visa expert, runs a non-discretionary international real estate development fund. He is now an adjunct instructor at The NYU Schacht Real Estate Institute teaching a graduate level course called the Development Process. The EB-5 immigrant investor program grants foreign investors green cards in exchange for job-creating investments of at least $500,000 in the U.S.
Great turnout and the layout was beautiful for ease of networking and meeting new people. The B’nai B’rith New York City Real Estate Unit is a part of B’nai B’rith International. In addition to providing services for members through the umbrella organization, they hosted monthly industry luncheons and other events featuring influential figures in real estate and business. Net proceeds collected from our events support B’nai B’rith’s charitable efforts. B’nai B’rith International has advocated for global Jewry and championed the cause of human rights since 1843. B’nai B’rith is recognized as a vital voice in promoting Jewish unity and continuity, a staunch defender of the State of Israel, a tireless advocate on behalf of senior citizens and a leader in disaster relief. With a presence in more than 50 countries, B’nai B’rith is the global voice of the Jewish community.